A new study by the University of Arizona Microbiology Professor, Dr. Chuck Gerba ranks the TV remote control as holding the highest level of bacteria in a patient's hospital room. The bacteria can lead to Nosocomial Infection, or hospital-acquired infection. Among the bacteria found, MRSA the dangerous antibiotic-resistant bacteria were only discovered on the remote controls. There were no traces of it on any other objects tested. Conduct ongoing research and studies to determine if the incidence of nosocomial infections and deaths are reduced in hospitals/medical centers. Engage in future discussions addressing solutions to the growing number of illnesses and deaths related to nosocomial infections. Note: Each remote was tested after the patient was released and the patient room was cleaned. The average total bacteria on the remote controls was 320. 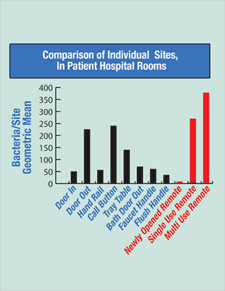 The average total bacteria on sites in the hospital room was 91. The average total bacteria on newly opened disposable remotes was 8.35. There was no detection of Staphylococcus Aureus on newly opened disposable remotes. 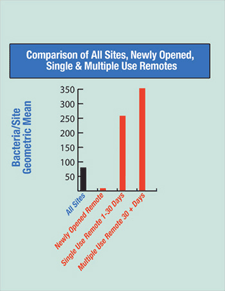 MRSA bacteria were present on television remote controls in patient hospital rooms. More than 2 million Americans acquire hospital-related infections each year. Almost 90,000 deaths are reported each year due to nosocomial infections. Patients with Staph infections spend an average of 14 days in the hospital compared to other patients.